Categories are most unstable things in jeweller Marian Hoskings practice so it’s a small irony that as part of the Masters of Australian Craft exhibition programme, she has been named a Living Treasure, a fairly immovable classification. Separated, living and treasure are ideas that resonate, chime even, throughout her almost forty year practice and are absolutely fitted to this bright trove of an exhibition. 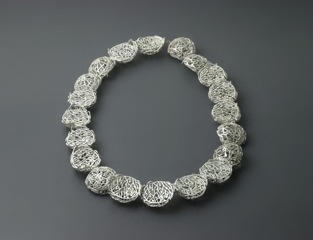 Hosking’s work is always an outgrowth of her experience, coming from the kind of corporeal and sensual knowledge derived from being in and of the world so that while her pieces are the nexus for the exploration of ideas, this is crucially connected to their being jewellery designed for and connected with the body. Her pieces are never abstract propositions but full of and weighty with vibrant life, beauty and desire. These are objects to be handled, desired, given and worn. That the living world is Hosking’s continuing wellspring is immediately apparent in the energy and intimacy with which she handles and reconfigures the plant and landscape forms that are her maker’s lexicon. First appearances are museological with the works shown in four cabinets named for the regions that the work springs from; Arid Lands, Sydney Heathland, East Gippsland and Coastal. The idea of the discrete collection is reinforced by the inclusion of a vessel in each, deliberately referencing early botanists vasculums for collecting plant specimens, the preponderance of brooches too with their resemblance to the sprigs and sprays of specimens recalls the act of collecting as a way of knowing the world. Each piece precisely evokes their landscape and form and material are married perfectly giving her works the quickness of life. The stunning Eremophila Neckpiece (2007) and the Heart Shaped Round Leaf Gum Necklace (2006) and Round Leaf Gum Brooch (2006) in Arid Lands have the robust quality of the plants of this landscape while Sydney Heathlands contains the delicate Coral Fern brooch (2006) and the stunning Gum Chain Unit (2007), a large linked chain composed of looped twigs cast in silver (with leaves and gum nuts attached) with its feeling of flexure that speaks of moisture and sappy life. Many of the objects in East Gippsland are scourged as if by fire, Vine Brooch 2007, the cast rings, Fern Ring (2007) and Kunzea Ring (2007) resemble those misshapen objects retrieved from burnt homes, made significant by their transformation and survival. 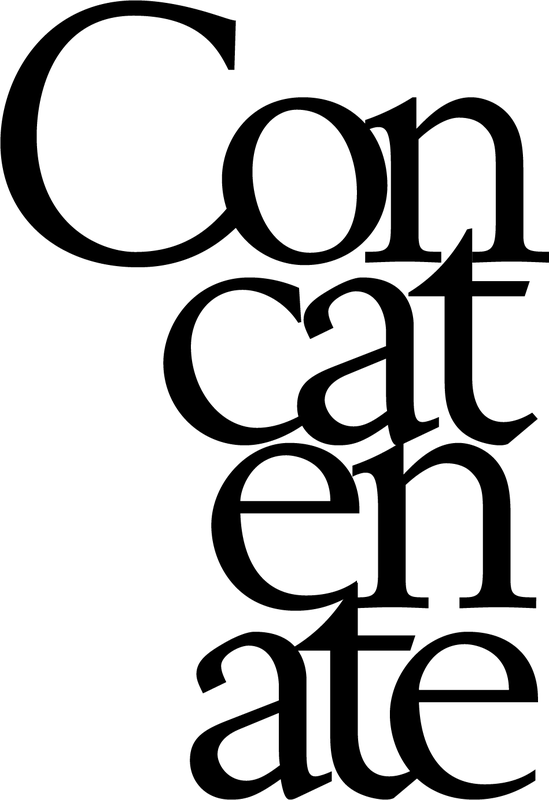 There is though, a feeling of unfixedness about these collections, as if they could drift, expand, scatter, the objects be reborn as something else. The cast pieces, rings and brooches, are most unsettling with their uncanny death in life feel and the disjuncture between natural forms and inert material. Made via lost wax, they are a literalisation of the original lost object and presence and absence sit alongside each other in them. These small perfect simulacra quietly unsettle the categories of natural and made producing this feeling of instability, of boundaries shifting. This indeterminacy is particularly pronounced in the last cabinet, Coastal, which holds a slew of detritus like objects. 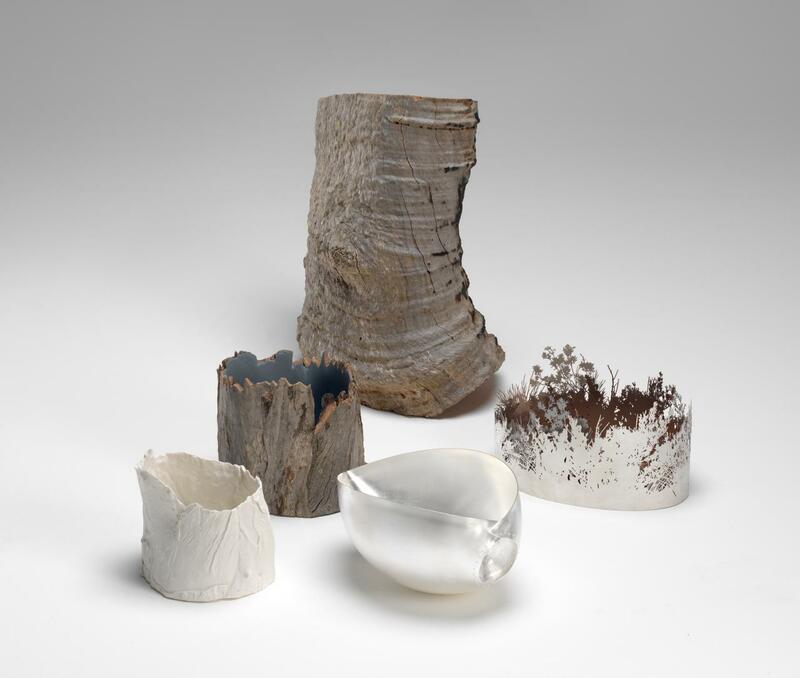 But it is not that simple, things shape shift and are not quite what they seem, the uncanny cast rings incorporate man made stone and natural shells, a child’s found plastic tea cup found is recast in silver, barnacles turn out to be blackened metal. In this Hosking disrupts the signs of nature and makes clear the impossibility of containing and describing the world through collection, classification and language. While Hosking makes extensive use of motif, with many of the pieces essentially silhouettes cut from sheet silver, these are not direct transcriptions from nature as she fully exploits the graphic nature of these forms through repeating layering, shifting and flipping with a robust economy and clarity of form. Woody Pear (2007) is made of two pieces of the same motif, simply flipped, mirroring each other. Eremophila Neckpiece (2007) most of all exemplifies Hoskings graphic sensibility and skill, composed of multiple flat silhouettes of an Eremopila bush, strung from black twine. Shown in the cabinet it sits with the pieces stacked and fanned out, the loops forming a kind of articulated spine. On the body the pieces would overlap, layer and move with the wearer, an animated connection between wearer and world. It’s this that Hosking’s reworking of nature suggests, that moments of marvel and connection to the natural world can be evoked and mediated through the connection between wearer and the intimate made object. At the centre is Tall Tree (2006) an expansive silver bracelet the circumference of an ancient Errinundra Shining Gum, one of the very last, very tall trees of the East Gippsland. Tall Tree is cast in silver from direct impressions taken in wax around its massive base, it sits undulating and light on a round table with a hole at its core, an evocation of the absent tree that the viewer must move around. An act of circumnavigation in itself. The bracelet with its individual detail evokes the absent tree vividly as a living presence in a way that would not be possible with the actual tree, so accustomed are we to seeing nature as spectacle, as unconnected from ourselves in our intimate scale. In making Tall Tree, Marian Hosking’s finger and thumbprints were recorded in the wax strips through the act of pushing them against the tree’s surface. This most intimate contact exemplifies the core of Hosking’s work, on one side the texture of bark and lichen, on the other the human texture of fingerprints and the mark of the maker making. Bonded by silver, pressing up against each other, the living trace of each is there to be felt, a moment only available though this made object. Perhaps in this, she suggests that we only know the world truly through our fingertips.